What could be better than friends and food? My cooking club, the GINGERS (Girls In Need of Gourmet Experience Really Soon) got together recently for a Chinese meal, Southern-style. 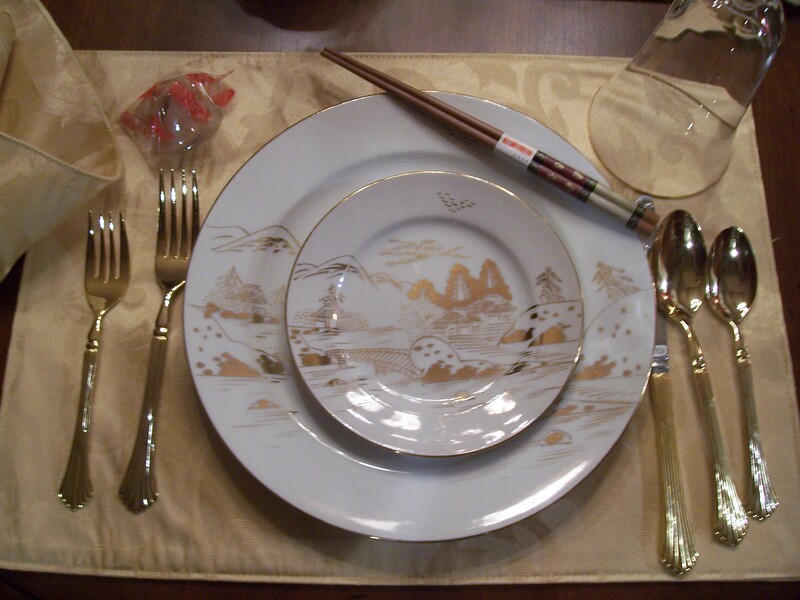 We were all impressed with the tableware our hostess used: A set of dishes her ex-father-in-law had bought in Southeast Asia decades ago. 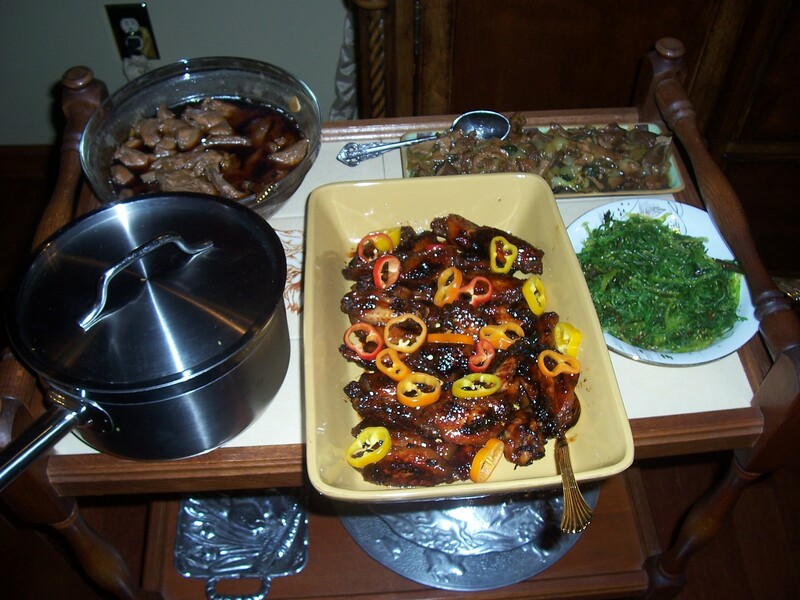 And even better was the food everybody brought to put on these dishes: Seaweed salad, barbecue chicken wings with peppers, a mushroom medley, jasmine rice, spicy cookies and other yummy dishes. I’m always amazed at how culinarily creative and innovative my fellow GINGERS are — I’m definitely the weak link and I think they keep me around only because I’m the one with the most e-mail patience when it comes to setting our meeting dates (“If Polly can’t do Saturday the 15th and Sarah can’t come on Tuesday the 23rd and Cheryl’s out of town on Monday, can everybody do next Friday, instead?”) My contributions to the evening were quick run-into-the-store additions to the menu: Chinese wine and beer, vegetable and brown rice sushi, almond cookies and some chocolate-covered Piroutte-like cookies. But I have an excuse: I was babysitting my 23-month-old grandson, Capt. Adorable. Plus, believe me when I say anything I could buy would serioulsy taste tons better than anything I could make. One of the best things one of us brought, however, wasn’t food at all. One GINGER has a granddaughter adopted from China. She brought one of the traditional gift bags her granddaughter had given her classmates to celebrate the recent Chinese New Year and told us all about what the various items represented — fascinating! So we learned as well as ate and talked and laughed. Our evening was a balanced blend of exploring authentic Chinese food and celebrating the Americanized versions we’ve all come to know and love. Now we’re trying to decide if we want to tackle Irish or not. The only thing I know about Irish cooking is that I love the fried mashed potatoes at McGuire’s Irish Pub in Pensacola, Florida — but I’m willing to learn. 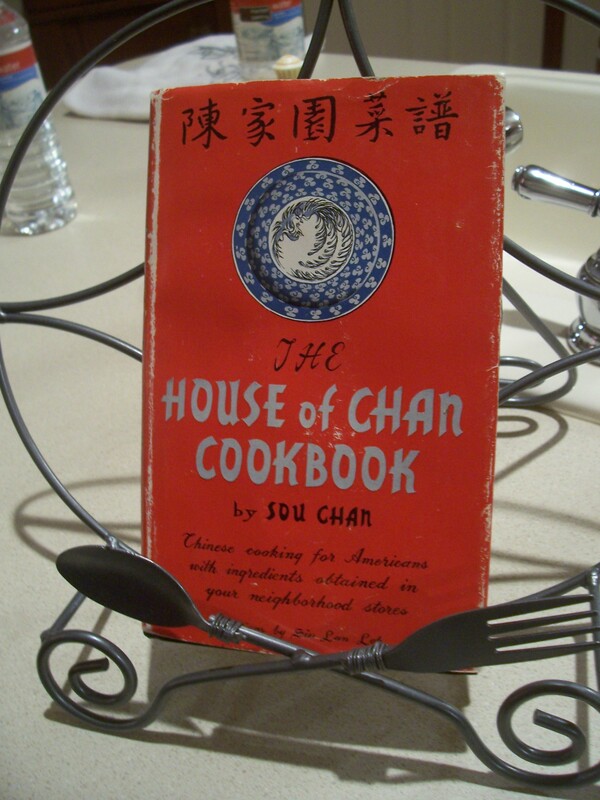 This entry was posted in Alabama, food, friends, home and tagged Chinese food, Chinese New Year, cooking clubs, decorating, entertaining, food, friends, menus, shopping, tablescapes by Coffee with Cathy. Bookmark the permalink. 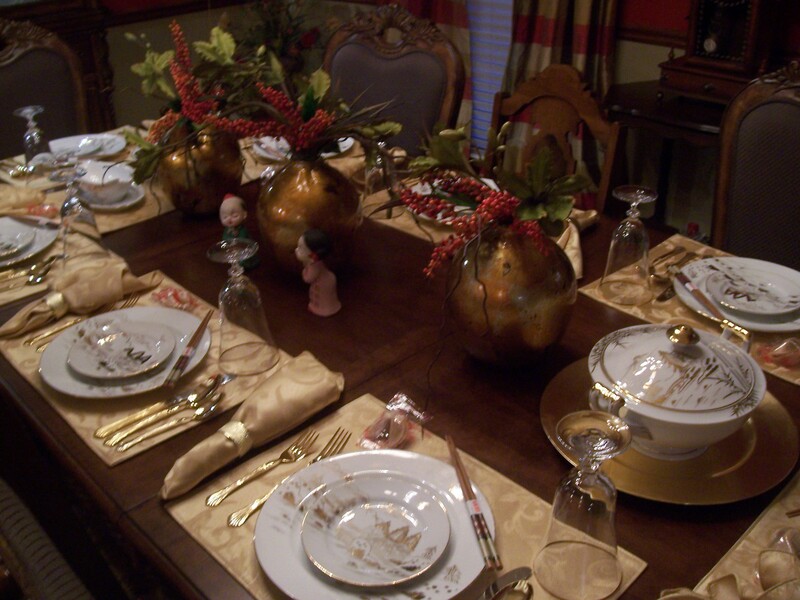 I love that table setting. And I can just hear that British woman saying You ARE the weakest link! Oh, Evelyn, it is so true! But somehow they let me stay. I forgot: We also had hot-and-sour soup and some wonderful dumplings. Yum! Oh sure, use the Capt as an excuse. Do you think I’m jealous, much?